The monthly roll cycle starts Tuesday April 5th for Crude Oil with the 4-day rolling of USO positions, the USO is an exchange traded security meant to track movements in the WTI futures contract. This happens over a four day period now from the 5th-8th of April, so that traders cannot easily front-run the rollover process. Nevertheless, obviously with the price of Crude rising, the USO has to sell a lot of front month longs in the May contract to rollover to the June contract. 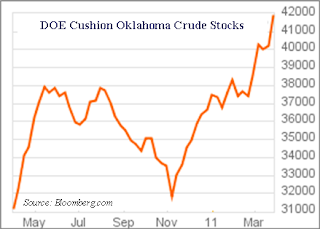 Based on the listed holdings as of Monday April 4, USO will roll over 8,400 WTI Crude Futures for the May contract on the ICE exchange, and also has to rollover 8,821 CL Crude Futures for the May contract on the Nymex exchange, and 2,000 Crd. Oil Fincl. Futures WS for May also on the Nymex exchange. Next we have the Brent contract Rollover schedule which begins with options that expire on the 12th of April with the futures contract expiring on the 15th of April. However, expect traders to position ahead of the actual expiration date as most traders will roll their Brent futures contracts sometime between the 8th and the 13th and for options the 8th through the 12th serves as a good rule of thumb. For the WTI rollover we have options expiring on the 14th of April, and futures on the 19th of April, but again most of the rollover takes place prior to the last 2 days of the date of expiration. So expect most traders to rollover positions somewhere between the 12th through the 15th of April. For options activity it would be the 12th through the 14th. The roll methodology can take several different directions according to trader`s expectations. 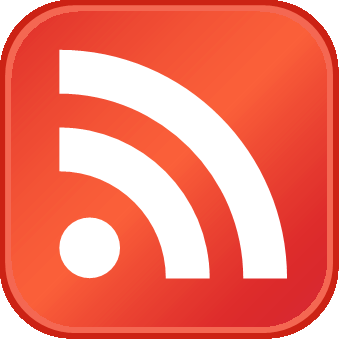 Besides the procedural roll of the USO, which over 4 days they sell May contracts and buy June contracts in the same instruments; however, for the rest of the traders there is more discretion involved. For example, often times traders know that a large base of positions have to be rolled over, so they close out their positions, and wait for the selling to end before then buying the next month`s contract to keep their original bias in the market. Some traders even short the market at the same time they are closing out their original longs because they know that a large roll of longs will be closed out, so they piggy back on the rollover for additional profits. This is oftentimes why you experience 4 or 5 days of weakness due to the selling, and shorts piggybacking on the rollover, with two days of strength in the expiring contract as the shorts have to go long to close out their positions before the contract expires. If we look at recent contract rollovers for the last several months, the pattern has been to move up the futures contract from the last two days of the expiring contract, and right up until the USO starts the entire rollover sequence again. As such, most of the gains for each new month come right at the beginning of the next month’s contract being the front month. The reason for this is apparent, as new money can come into the contract with new positions without the worries of having to rollover their position or take physical delivery. Again, we saw this with this month`s contract, so the pattern is holding. However, we have an interesting test case for markets, and the long standing argument that markets are never run-over by speculators, because in the end, all market participants have to take physical delivery or close out their positions, so they cannot affect price over the long term. 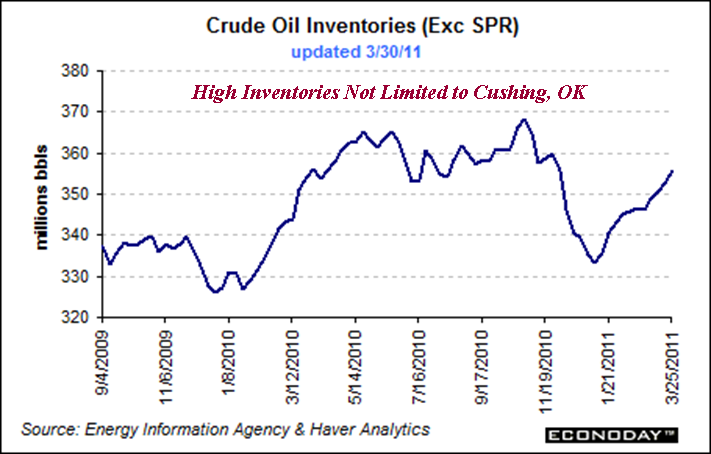 Well, with Cushing inventories at record highs, literally bursting at the seams (see charts below), and only going to get worse over the next two weeks, and given the fact that the WTI contract is deliverable at the Cushing hub, we will finally test whether that hypothesis is true. 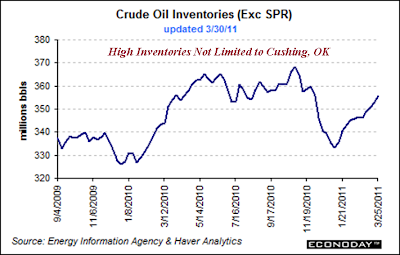 In other words, there is no way traders can take delivery on enough crude for the expiring May contract to not go down from current levels, because there isn`t sufficient storage capacity. Anybody who opened a new position for the May contract, and there were lots of newly created long positions with a rising oil price for this contract, must close out these longs by selling the May contract, thus making the front month go down. The reason it is a test is that unless traders arrange for a bunch of tanker trucks to back up to the Cushing hub, which is mighty expensive and cumbersome, also considerations of what you do with the Oil after taking delivery, i.e., major additional transportation and storage costs, and the WTI contract doesn`t go down, we now know that the taking physical delivery argument is an invalid argument. Moreover, there are ways to move up futures contracts without taking physical delivery. All of which would shine a bright spotlight on the role and power of speculators in driving up Oil prices, and how previous regulations have failed to address the major divergences between the underlying supplies in the market, and the prices reflected by the futures contracts trading on the exchanges. It seems that if we look back at 2008 where Oil prices basically went from $143 to$33 a barrel in six months, and Oil being a rather inelastic commodity, that some of the practices that go on in regard to speculation in this commodity, have been stubbornly neglected and overlooked by regulators. If these boom and bust price spikes continue, they are not truly reflective of underlying fundamentals. 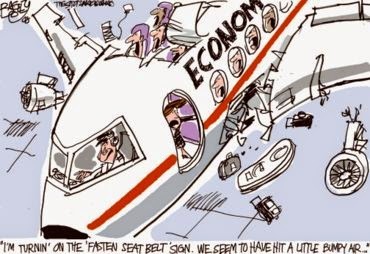 As they push markets in both directions far past the underlying supply and demand dynamics of the market, this price instability isn`t good for consumers, producers, exporters, importers, refiners and the global economy. 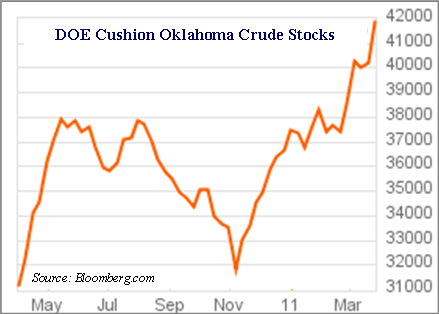 Having a healthy, stable Oil market devoid of excessive speculation is in everyone`s best interest over the long haul. What the regulatory framework needed to accomplish this lofty goal is another matter entirely. 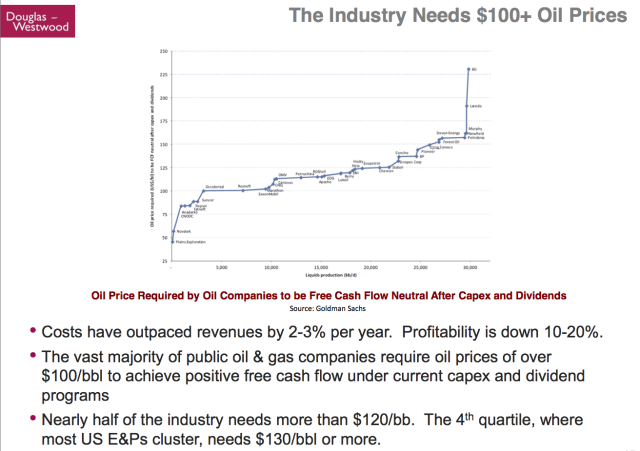 However, one thing is for certain--the Oil market reflects more of the characteristics of a Las Vegas Casino game, and less the characteristics of a hedging instrument used for legitimate price discovery of the underlying commodity reflected by supply and demand fundamentals in the marketplace.